Pentax K-1 II with Free Grip is Back! The new Pentax K-1 II is now in stock, and a great deal is back! Order yours today from B&H to secure a free BG-6 battery grip, which is a $219 value. This brings the price of the K-1 II within $100 of the original K-1. As icing on the cake, once your order ships, you can claim a whole year of Marketplace access by following these instructions. This is a limited-time special; once the deal expires, the K-1 II will sell at its MSRP of $1996.95 with no free grip. We recently posted our first impressions of the K-1 II's new Dynamic Pixel Shift mode, which increases resolution and reduces noise when shooting hand-held. Learn more about the Pentax K-1 II in the official announcement. DA 35mm F2.4 - Only $96.95! 40% Off Storewide at Topaz: Spring Sale! Support us by shopping at our partner stores: B&H Photo and Adorama. 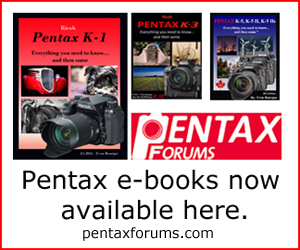 We are the ultimate Pentax resource and home of the largest and friendliest forum for Pentax users! Whether you're looking for reviews, want to share photos, or just need help, you've come to the right place. We also offer free photo space and a host of official and unofficial photo challenges where you can test your skills. If you are not yet a member, you're missing out. Come join us- it's free! If you've found our site helpful, consider making a donation or buying Pentax gear through our trusted retail partners, B&H Photo and Adorama. By supporting us you help fund future content and site improvements. All site supporters are entitled to an account upgrade.